This material is taken from Chapter 9 - First Aid & Emergency Care from The Backpackers Field Manual by Rick Curtis. 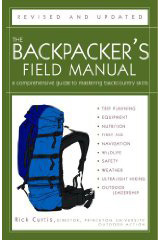 For more details on this exciting book check out The Backpacker's Field Manual Page. This material is provided by the author for educational use only and is not a substitute for specific training or experience. Princeton University and the author assume no liability for any individual's use of or reliance upon any material contained or referenced herein. When going into outdoors it is your responsibility to have the proper knowledge, experience, and equipment to travel safely. This material may not be reproduced in any form for commercial or Internet publication without express written permission of the author. Copyright © 1999, all rights reserved, Random House Publishing & Rick Curtis, Outdoor Action Program, Princeton University. The body has a number of mechanisms to properly maintain its optimal core temperature of 98.6° F (37° C). Above 105° F (40° C), many body enzymes become denatured and chemical reactions cannot take place, leading to death. Below 98.6° F (37° C), chemical reactions slow down, with various complications that can lead to death. Understanding thermoregulation is important to understanding heat illnesses and cold injuries. Vasodilation increases surface blood flow, which increases heat loss (when ambient temperature is less than body temperature). Vasoconstriction decreases blood flow to the periphery (arms and legs), decreasing heat loss. Sweating cools the body through evaporative cooling. Shivering generates heat through increase in chemical reactions required for muscle activity. Visible shivering can maximally increase surface heat production by 500 percent. However, this is limited to a few hours because of depletion of muscle glucose and the onset of fatigue. Active exercise is much more efficient at heating than shivering. Increasing or decreasing activity will cause corresponding increases in heat production and decreases in heat production. Behavioral responses, such as putting on or taking off layers of clothing, will result in thermoregulation. Windchill can have a major impact on heat loss through convection. As air heated by your body is replaced with cooler air pushed by the wind, the amount of heat you can lose in a given period of time increases. This increase is comparable to the amount of heat you would lose at a colder temperature with no wind. The windchill factor is a represented by a scale that shows the equivalent temperature given a particular wind speed (see Windchill Index, below). In hot weather, especially with high humidity, you can lose a great deal of body fluid through exercise. This can lead to a variety of heat-related illnesses, including heat exhaustion and heatstroke. Heat challenge is a combination of a number of external heat factors. Balanced against this heat challenge is your bodys methods of heat loss (passive and active). When the heat challenge is greater than heat loss (positive factors), you are at risk for a heat-related injury. In order to reduce the risk, you need to either decrease the heat challenge or increase your heat loss. Maintaining proper fluid balance is a central part of exercising in a heat challenge. Ambient temperature is not the only factor in creating the potential for heat injuries; humidity is also important. Since our bodies rely on the evaporation of sweat as a major method of cooling, high humidity reduces our ability to evaporate sweat and cool the body, increasing the risk of heat illnesses. The Heat Index, page 290, shows the relative effects of temperature and humidity. 105°129° (3154) Heat cramps or heat exhaustion likely. 130° and up (54 and up) Heatstroke very likely. Caution: This chart provides guidelines for assessing the potential severity of heat stress. Individual reactions to heat will vary. Heat illnesses can occur at lower temperature than indicated on this chart. Exposure to full sunshine can increase values up to 15° F.
Heat illnesses are the result of elevated body temperatures due to an inability to dissipate the bodys heat and/or a decreased fluid level. Always remember that mild heat illnesses have the potential of becoming life-threatening emergencies if not treated properly. Replace salt and fluid (see Fluid Balance, page 285) and stretch the muscle (see Stretches for Hiking, page 144). Kneading and pounding the muscle is less effective than stretching and probably contributes to residual soreness. Heat syncope (fainting) is a mild form of heat illness that results from physical exertion in a hot environment. In an effort to increase heat loss, the blood vessels in the skin dilate to such an extent that blood flow to the brain is reduced, resulting in symptoms of faintness, dizziness, headache, increased pulse rate, restlessness, nausea, vomiting, and possibly even a brief loss of consciousness. Inadequate fluid replacement that leads to dehydration contributes significantly to this problem. Heat syncope should be treated as fainting (see page 267). The person should lie or sit down, preferably in the shade or in a cool environment. Elevate the feet and give fluids, particularly those containing salt (commercial rehydration mix or 1/2 teaspoon salt and 1/2 teaspoon baking soda per quart or liter). The patient should not engage in vigorous activity at least for the rest of that day. Only after she has completely restored her body fluids and salt and has a normal urinary output should exercise in a hot environment be resumed, and then cautiously. Victims of heat exhaustion must be properly rehydrated and must be very careful about resuming physical activity (it is best to see a physician before doing so). Treatment is as described for heat syncope, but the person should be more conservative about resuming physical activity to give the body a chance to recover. Have the person rest (lying down) in the shade. Replace fluid with a water-salt solution (commercial rehydration mix or 1/2 teaspoon salt and 1/2 teaspoon baking soda per quart or liter). Drink slowly; drinking too much, too fast very often causes nausea and vomiting. Evacuation is not usually necessary. Heat exhaustion can become heatstroke if not properly treated. A victim of heat exhaustion should be closely monitored to make sure that her temperature does not go above 103° F (39° C). If it does, treat the person for heatstroke. Heatstroke is an immediate life-threatening medical emergency. A victim can die within minutes if not properly treated. Heatstroke is caused by an increase in the bodys core temperature. Core temperatures over 105° F (41° C) can lead to death. The rate of onset of heatstroke depends on the individuals fluid status. To understand heatstroke, think of that same car pulling a trailer up a mountain pass on a hot day. This time the radiator has plenty of fluid, but the heat challenge of the engine combined with the external temperature is too much. The engine cant get rid of the heat fast enough and the engine overheats. There are two types of heatstrokefluid depleted (slow onset) and fluid intact (fast onset). Fluid depleted: The person has heat exhaustion due to fluid loss from sweating and/or inadequate fluid replacement, but continues to function in a heat challenge situation. Ultimately, the lack of fluid minimizes the bodys active heat-loss capabilities to such an extent that the internal core temperature begins to rise. Example: a cyclist on a hot day with limited water. Fluid intact: The person is under an extreme heat challenge. The heat challenge overwhelms the bodys active heat-loss mechanisms even though the fluid level is sufficient. This typically has a very fast onset. Example: a cyclist pushing hard on a 104° F day (40° C). Efforts to reduce body temperature must begin immediately! Move the patient (gently) to a cooler spot or shade the victim. Remove clothing. Pour water on the extremities and fan the person to increase air circulation and evaporation, or cover the extremities with cool wet cloths and fan the patient. Immersion in cool (not cold) water is also useful. Cooling extremities should be massaged vigorously to help propel the cooled blood back into the core. After the temperature has been reduced to 102° F (39° C), active cooling should be reduced to avoid hypothermia (if shivering begins, it produces more heat). The patient must be monitored closely to make sure her temperature does not increase again. She will probably need fluids regardless of the type of onset. Apply basic life support (CPR) if needed. Afterward, there can be serious medical problems. Prepare to evacuate your patient. Hypothermia is a decrease in body core temperature to the point where normal body functions are impaired (see Shell/Core Response, page 241). The key to combating hypothermia is prevention. Although the risks are highest during cold winter conditions, hypothermia can happen at any time of the year. The classic example of hypothermia is the summer hiker on Mount Washington in New Hampshire dressed in cotton shorts and a T-shirt. The weather changes rapidly. A sudden thunderstorm drops the temperature from 80° F (27° C) to 60° F (16° C) with strong wind and rain. In these conditions, hypothermia can start to occur almost immediately and become severe in less than an hour. Wear proper clothing. Choose materials that keep you warm even when wet. Wetness equals death. Have proper rain gear to keep you and your clothing dry. Eat small amounts of food at frequent intervals to maintain the bodys energy reserves. Carry carbohydrates to snack on, because they provide quick energy, and protein and fat to eat before bed, because they burn slowly, providing energy overnight. Try not to push yourself to your physical limits in cold weather. Always leave your body with energy in reserve. Stay well hydrated. Dehydration quickens hypothermia, so force yourself to drink, even if you do not feel thirstyup to 4 quarts (liters) a day in the winter or hot summer. Drink hot liquids. Try to avoid drinking excessive cold fluids, since body heat is used to warm them to body temperature. Avoid caffeine. It is a vasoconstrictor that increases the chances of peripheral frostbite. Avoid alcohol. It is a vasodilator and increases heat loss. Adjust your clothing frequently so that you are neither too hot nor too cold. If you are too hot and you begin to sweat, the wet clothing will rob you of heat 25 times faster than dry clothing. Be aware of the impact of windchill on increasing the rate of heat loss (see Windchill Index, page 288). Have pairs of people zip their sleeping bags together and sleep together as a preventative measure on cold nights. Be alert to sudden weather changes and be able to make a quick evaluation of your groups condition. Has the temperature dropped? Do people have their hats on? Has everyone been eating? Drinking? Is everyone wearing wind or rain gear? What is the condition of the weakest member of the group? If shivering can be stopped voluntarily, it is mild hypothermia. If shivering cannot be stopped voluntarily, it is moderate to severe hypothermia. If you cant get a radial pulse at the wrist, it indicates a core temperature below about 90° F (32° C). Check pulse and respirations carefully. Even after a full minute, you may not be able to detect a pulse or respirations and yet the person may still be alive. The body may be using a massive shell/core response to maintain basic life functions. A severely hypothermic person may appear dead. The person may be rigid, blue, and curled up in a fetal position. Try to open her arm up from the fetal position; if it curls back up, the person is alive. Dead muscles wont contractonly live muscles. Treatment The basic principles of rewarming a hypothermic patient are to conserve the heat she has and replace the body fuel she is burning up to generate that heat. If a person is shivering, she has the ability to rewarm herself at a rate of 4° F (2° C) per hour. Reduce Heat Loss Remove patient from wind and cold if possible. Remove all wet clothing. Make sure the person is properly clothed (dry polypropylene, pile, and outer shell). Increase physical activity. Provide shelter. Add Fuel and Fluids It is essential to keep a hypothermic person adequately hydrated and fueled. Food intake should include hot liquids, sugars, GORP. Avoid alcohol, caffeine, and tobacco or nicotine. Add Heat Bring the patient near a fire or other external heat source. Provide body-to-body contact. Put her in a sleeping bag, in dry clothing, with a warm, dry person. If the patients condition improves, evacuation may not be necessary; but if condition worsens or does not improve, prepare to evacuate your patient when she is able, or send for help. Use all of the treatment methods above. Reduce heat loss. Make hypothermia wrap. The idea is to provide a shell of total insulation for the patient. No matter how cold, patients can still internally rewarm themselves more efficiently than any external rewarming. Make sure the patient is dry and has a polypropylene layer next to the skin to minimize sweating. The person must be protected from any moisture in the environment. Use multiple sleeping bags, blankets, clothing, and foam pads to create a minimum of 4 inches (10 centimeters) of insulation all the way around the patient, especially between the patient and the ground. Include an aluminum space blanket to help prevent radiant heat loss, and wrap the entire ensemble in plastic to protect from wind and water. Use a plastic garbage bag as a diaper to prevent urine from soaking the insulation layers. Add fuel and fluids. For people in severe hypothermia, the stomach has shut down and will not digest solid food but can absorb water and dilute sugars. Give a dilute mixture of warm water with sugar every 15 minutes. Dilute Jell-O® works best, since it is part sugar and part protein. This will be absorbed directly into the bloodstream, providing the necessary calories to allow the person to rewarm herself (one box of Jell-O® = 500 kilocalories of heat energy). Do not give full-strength Jell-O, even in liquid formit is too concentrated and will not be absorbed. Encourage urination. People often have to urinate due to cold diuresis. The bodys vasoconstriction creates greater volume pressure in the bloodstream. The kidneys pull off excess fluid to reduce the pressure. A full bladder is a place for additional heat loss, so urinating will help conserve heat. You will need to help the person urinate. Open up the hypothermia wrap enough to do this and then cover the person back up. You will need to keep the individual hydrated with the dilute Jell-O® solution. Add heat. Heat can be applied to the skin where the major arteries are near the surfaceat the neck for the carotid, at the armpits for the brachial, and at the groin for the femoral artery. Chemical heat packs such as the Heat Wave provide 110° F (43° C) for 6 to 10 hours. You can also use hot water bottles, warm rocks, towels, and compresses. For a severely hypothermic person, positive pressure ventilations (rescue breathing) can provide oxygen and heat. You should not attempt to evacuate someone in this advanced state of hypothermia. Moving the person can cause the heart to stop. Send for advanced medical care or wait until the condition stabilizes. When a person is in severe hypothermia, she may appear to be dead: cold, blue skin; fixed and dilated pupils; no discernible pulse or breathing; comatose and unresponsive to any stimuli; rigid muscles. As a rescuer, you cant be sure, so your job is to rewarm the person and do CPR if indicated. If after rewarming the patient still doesnt respond, then she is dead. Treatment follows the saying "a hypothermic patient is never cold and dead, only warm and dead." Make sure you do a complete assessment of heart rate before beginning CPR. Remember, the heart rate may be 2 to 3 per minute and the breathing rate one per thirty seconds. During severe hypothermia, the heart is hyperexcitable, and mechanical stimulation (including CPR, moving the patient, or after-drop, see page 299) may result in ventricular fibrillation, leading to death. As a result CPR itself may be contraindicated for some hypothermia situations. Also, instituting cardiac compressions while the heart is still beating on its own may lead to life-threatening arrhythmias. Check the carotid pulse for a longer time period (up to a full minute) to ascertain if there is some slow heartbeat. Even though the heart is beating very slowly, it is filling completely and distributing blood fairly effectively. External cardiac compressions are only 20 to 30 percent effective. Thus, the body may be able to satisfy its reduced circulatory needs with only 2 to 3 beats per minute. Be sure the pulse is absent before beginning CPR. Once you start doing CPR you will need to continue as you rewarm the person. Ventilation may have stopped but respiration may continue. The oxygen demands for the body have been so diminished with hypothermia that the body may be able to survive for some time using only the oxygen that is already in the body. If ventilation has stopped, artificial ventilation (rescue breathing) may be started to increase available oxygen. In addition, blowing warm air into the persons lungs may assist in internal rewarming. Check radial pulse; between 91° and 86° F (33° and 30° C) this pulse disappears. Check for carotid pulse; wait at least a full minute to check for very slow heartbeat. If there is a pulse but no breathing or slow breathing, give rescue breathing (also adds heat). If there is no discernible heartbeat, begin CPR and be prepared to continuepersons with hypothermia have been given CPR for up to 3.5 hours and have recovered with no neurological damage. Cold water can kill. Since the body loses heat 25 times faster in water, immersion hypothermia occurs at a much faster rate. In 50° F (10° C) water, a person can be shivering uncontrollably in 15 minutes and can be unconscious in 30 minutes (see chart below). Be extremely vigilant in cold water, such as during stream crossings. Treatment for immersion hypothermia is the same as described above. In cold-water immersion hypothermia, the Shell/Core response may occur so rapidly that there is sufficient oxygen in the blood to maintain basic body functioning over an extended period of time. Contrary to the old "6-minute rule" for doing CPR, successful resuscitations have been made after over 40 minutes of submersion in cold water. Rewarm the patient with a hypothermia wrap and be prepared to give CPR. Remember, a person is never cold and dead, only warm and dead. After-drop is a situation in which the core temperature actually decreases during rewarming, primarily an issue with sudden-onset hypothermia caused by cold water immersion. As the shell (the arms and legs) are rewarmed, the peripheral vessels in the arms and legs dilate. This dilation sends very cold blood from the shell to the core, further decreasing the core temperature, which can lead to death. If you are applying an external source of heat (chemical heat packs, hot water bottles, etc. ), apply them only to the major arteries (see above). Avoid after-drop by applying heat to the core only! Do not expose a severely hypothermic victim to extremes of heat.